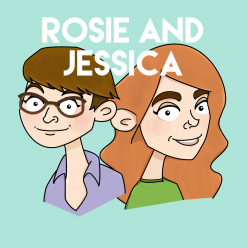 In episode 47, Rosie and Jessica once again take to the internet to record their annual start-of-year review-of-year episode. It’s mainly a quiz, which, as you may know, Jessica loves. Plus a round-up of the year as a whole, some Needle and Fed (largely mitten-based) and What Have We Seen This Week (oi!) This episode is brought to you by Andrew Keegan. Jessica picked If You Want To Sing Out by Cat Stevens and Rosie is 11 and a half months early with Low’s Just Like Christmas. Rosie went to Simply Christmas at the ExCeL and Fashioning Winter at Somerset House. Jessica has finished her Peekaboo Mitts and made Jodi Lewanda’s Mittens for All. She’s also done a lovely job on a Le Weekend Shawlette. Entirely correct pronouncements about Love Actually and While You Were Sleeping.